In a remote area of Vietnam lies a massive cave that could house a city block, and probably holds some ancient secret Nathan Drake is looking for. There's a hidden world in Vietnam's Annamite Mountains called Hang Son Doong that sounds like it could be a location in an Indiana Jones film or Uncharted game. The multi-million year old cave has barely been explored and is one of the largest in the world. 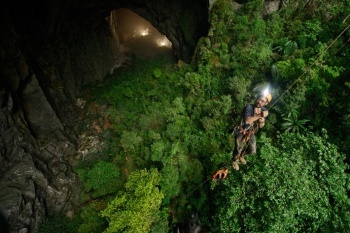 National Geographic followed the second expedition to ever enter the massive cave, with the first taking place in just 2009. The entrance would have remained secret if not for a local that discovered it as a child, but forgot about it for years until a recent rediscovery. Han Son Doong is estimated to have formed 2 to 5 million years ago, and is just one of many caves still not surveyed in Vietnam's Phong Nha-Ke Bang National Park. In the second expedition, the cave's explorers were able to surmount the 200-foot-tall wall of mud that ended their first effort make it through, but they say there is still much work to be done until they're done with the 2.5 mile Han Son Doong. The cave is an explorer's dream, and gives legitimacy to the secret worlds found in games like Uncharted 2. It likely doesn't house the tree of life though, so don't become a violent warlord on its account. Check out National Geographic's photo gallery of the incredible Han Son Doong here.